If this is the first time you've downloaded one of my freemiums, then you'll need to confirm your email address and then our system will email you your Marketing Automation Plan shortly after. If you run into any problems, want to share feedback or have suggestions. 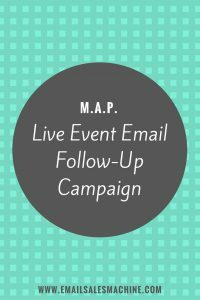 This Marketing Automation Plan is a complete system that's designed to help you launch a event follow-up email campaign series no matter what type of email automation software you're using.